Disgraced heavyweight Kash Ali could face a suspension of up to 12 months and a significant fine after his disqualification for biting David Price several times on Saturday night. 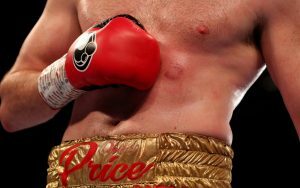 Price, who described his rival as “an animal”, was left with teeth marks on his stomach after the shocking incident in the fifth round of their non-title fight in Liverpool. Price also alleged that the 27-year-old Ali had bitten him at least twice in the opening two rounds. Referee Mark Lyson had no hesitation in pulling Ali off Price in the fifth round and disqualifying him. The British Boxing Board of Control will summon the Birmingham boxer to appear before his local Central Area Council this month, where his licence will almost certainly be suspended. Ali’s purse, around £20,000, has also been withheld. There was bad blood between in the pre-fight press conference last Thursday. It will not sit well with the Board that Ali later said his “street mentality” then kicked in, prompting him to lose composure and attack Price. In the second round, Ali bit into Price’s neck, before doing it to the former Olympic bronze medallist’s arm in the third stanza, finally leaving the visible marks on his stomach in the fifth. “I don’t want to share a ring with an animal like that again,” said Price when asked if he would consider a rematch with Ali, who had gone into the bout having won all 15 of his previous professional fights. When asked for his explanation, Ali told iFL TV: “It’s disappointing, man. It was out of order what happened. I had him hurt in the fifth, I could have stopped him, which I would have. We ended up wrestling down anyway and it was a stupid thing what I did, ridiculous. “There’s no excuses for it. I think just the build-up to the fight – it’s my first time boxing on a big stage. I was so pumped up, I just wanted to fight. The street mentality just kicked in, it was stupid. In previous biting incidents in the UK, the middleweight Adrian Dodson was banned for 18 months in 1999 and fined £1,000 for bringing the sport into disrepute. Then, the Southern Area Council decided that the 29-year-old was guilty of biting the Canadian Alain Bonnamie in the last round of their Commonwealth title fight. In 2009, the heavyweight Dereck Chisora copied Mike Tyson when biting Paul Butlin’s ear in a clinch. Chisora did not take a piece of Butlin’s ear or even cause him to bleed the way Tyson infamously did to Evander Holyfield, and the fight was allowed to continue, with Chisora winning by decision. He was fined £2,500 and was suspended for four months.